Seamus and Kevin Sheridan founded Sheridans Cheesemongers in 1995 with a small stall at the Galway market in their native Ireland. The stall was an intersection of the best cheeses in Ireland. Soon they had opened a shop in Galway and before long had expanded to Dublin, Waterford and opened a warehouse at the site of the Old Virginia Road Railway Station in Meath. The Sheridans are passionately committed to sourcing highest quality artisan products and forging links directly with the food producers. Their close relationships with their suppliers remain of utmost importance to the ethos of the company. 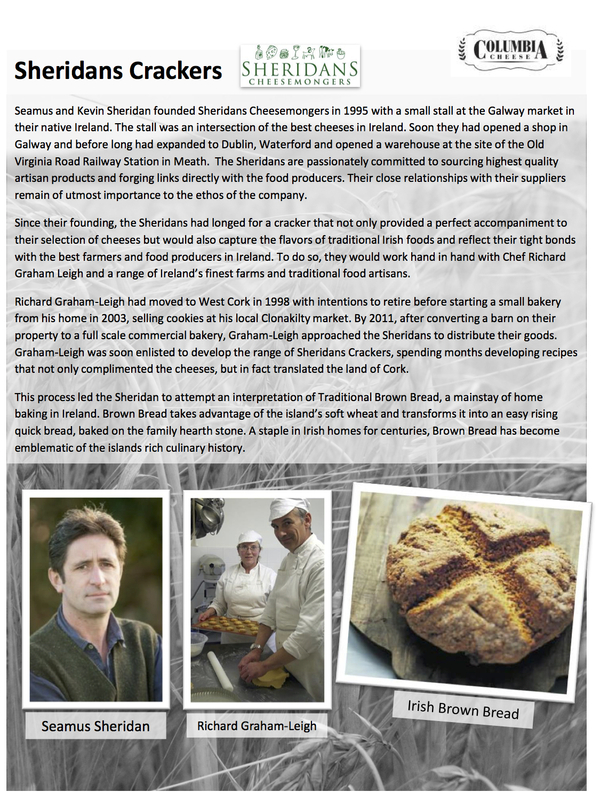 Since their founding, the Sheridans had longed for a cracker that not only provided a perfect accompaniment to their selection of cheeses but would also capture the flavors of traditional Irish foods and reflect their tight bonds with the best farmers and food producers in Ireland. To do so, they would work hand in hand with Chef Richard Graham Leigh and a range of Ireland’s finest farms and traditional food artisans. Richard Graham-Leigh had moved to West Cork in 1998 with intentions to retire before starting a small bakery from his home in 2003, selling cookies at his local Clonakilty market. 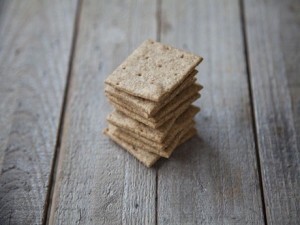 By 2011, after converting a barn on their property to a full scale commercial bakery, Graham-Leigh approached the Sheridans to distribute their goods. Graham-Leigh was soon enlisted to develop the range of Sheridans Crackers, spending months developing recipes that not only complimented the cheeses, but in fact translated the land of Cork. This process led the Sheridan to attempt an interpretation of Traditional Brown Bread, a mainstay of home baking in Ireland. Brown Bread takes advantage of the island’s soft wheat and transforms it into an easy rising quick bread, baked on the family hearth stone. A staple in Irish homes for centuries, Brown Bread has become emblematic of the islands rich culinary history.